This Abroad Blog of the Week comes from one of my dream locations: Cambodia! Our Dear Lady Expatriate (or ODLE for short) was introduced to me by a study abroad colleague and friend, and I’ve now been reading her posts for several weeks. Although ODLE’s blog is just a few months old, her experience living abroad and teaching English is extensive. 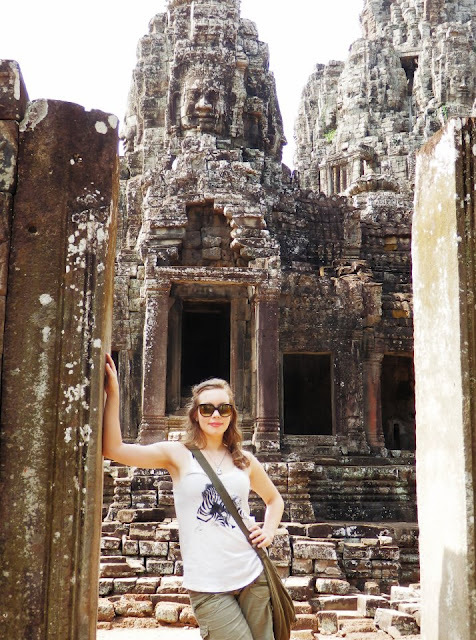 After living in South Korea for several years, she now finds herself in Cambodia and exploring her new host country. Her blog is full of fun fashion for the ESL teacher, weekly recommended links, and expat tips for living in Cambodia. I was able to catch up with the fun-loving Our Dear Lady Expatriate for a virtual interview and learn more about how her expat life all got started. 1. What got you started teaching English abroad and living the expat life? …Until, in fourth year, I was connected, via a mutual friend on Facebook, to a rather handsome fella who was living and teaching in England. A whirlwind long-distance romance ensued, and despite only having ever visited each other for three weeks total over the next year, we made plans to run away together to Korea as soon as I graduated. Somehow we made it through the first year of getting to know each other in a foreign country while living in a studio apartment, and have been happily rambling about ever since. So, at first, teaching was really just a tool that I used to attain the traveling life I desired. Since taking that initial contract, though, I’ve found that I was lucky enough to stumble upon my passion, and now teaching English is so much more than just a way to fund a ticket: it’s my chosen career, and I couldn’t be happier. 2. You’ve been abroad for some time. What made you decide to start your lovely blog just a few months ago? Combine the fact that I’ve been obsessed with reading blogs for years with my general propensity towards writing, brainstorming and ‘doing,’ and I’m surprised it’s taken this long, too! Partly, I credit a couple of blogs that I’ve recently found and deeply connected with. Both the diverse mix of content on Yes and Yes and the work ethic of the girls at A Beautiful Mess have been inspiring, as has the success of each of these blogs and the strong community aspect of each. Really, I think the ‘aha’ moment came when I was trying to find blogs in the ’20-something female expat living in Cambodia’ niche and came up empty. In fact, there are so many great backpacker blogs discussing this region (Grrrl Traveler, for one), but it can be a bit tricky to find quality stay-put-expat lifestyle blogs that regularly post. The discovery of this massive gap really acted as a swift kick to my behind to try my hand at generating my own content. 3. With your adventure-seeking taste buds, is there any type of food in Cambodia you won’t try? Actually, I’m afraid you’re giving me more credit than I’m due! In any group, I’m bound to be the least likely to try the ‘odd’ items on the menu, and up until about a year ago, I was totally vegetarian. I constantly feel less than adventurous when dining out with my Partner In Crime, who tends to zero in on dishes like “Sea Cucumber Covered In Black Ant Sauce”. HOWEVER. One of my upcoming goals before my 27th birthday (the rest of which will be announced at the start of September on my site!) is to try frog, and another is to give fresh durian a proper go. Maybe they will be the turn-over-a-new-leaf moments that I’ve been waiting for? I really would love to amass some crazy food stories to shock my Grandma and my buddies alike! Stay tuned! 4. How has your move to Cambodia been different from your move to South Korea? Personally, the first time I moved to Korea, at age 21, I had absolutely no idea what I was getting myself into. All I knew was that I was moving there with this guy who I was pretty sure I was in love with, and that it was a foreign country, bound to be chock-full of adventure. As aforementioned, the prospect of teaching really didn’t have that much to do with anything at that point. Now, discovering new systems of education in each country is a major part of the appeal, and I’m excited to have the opportunity to try out different methods, such as Montessori. Experience has also bestowed a confidence in myself that I know I’ll be able to hack it anywhere, which was glaringly absent throughout that first year in Korea! Logistically, the two are very different. South Korea requires a lot of prep while still in your home country, but your travel expenses are paid and you walk into a life that’s been set up for you. In Cambodia, you hand out resumes in person and need to take care of travel and lodging yourself. In hindsight, I’m glad I got my expat footing in Korea before being left to my own devices in Cambodia. 5. How is learning Khmer going? Well, I’m a month and a half into living here, and I’ve got the essentials (like giving directions) figured out, but little else. I’ve gotten a lot of use out of the bits and pieces that I know, though! Truly, every time I’ve attempted to speak in Khmer, I’ve gotten a lovely reaction from the listener, even if I’ve botched it. It’s very encouraging, and I’ve really been motivated by sincerely wanting to speak with the people around. The focus of the first couple of weeks was to set up my little life and to nab a job or two, and now I’m ready to dig in, starting with working on the pronunciation of common sounds, which are quite distinct from English. I’m keen to have my students stop giggling when I butcher the pronunciation of their names when calling attendance! 6. Do you have any “learn from my mistake” advice for future ESL teachers/expats? For anyone moving to Korea, I would absolutely recommend putting the few days of study into learning how to read Hangul. It’s not nearly as difficult as you might imagine, and it will give you such a greater sense of belonging in your new home. I also generally found learning Korean gave me more empathy towards my students. The icing on the cake is that it will never fail to impress people (outside Korea) that you can phonetically read another alphabet! I wish I’d put the effort in the first time around. I would also say that if you’re living in South Korea, there’s little excuse for not saving half your pay check. I didn’t do this the first year, and I cannot tell you where that money went. Cute stationery and hair bows? I don’t know! That’s something I did entirely differently the second year I lived there: every month, on the day I was paid, I would immediately send a pretty sizable chunk to my Canadian bank account. Soju’s cheap, Korean restaurants are cheap, transportation’s cheap, renting singing rooms is cheap – use the opportunity to bank some cash and fund some amazing future travels! Thanks Our Dear Lady Expatriate for the interview! This entry was posted in Abroad Blogs of the Week and tagged Abroad Blog of the Week, Cambodia, Culture, ESL, Expat, Teaching Abroad, Travel on August 22, 2012 by eliseblalock. Oh great, now I’m itching to travel to South Korea and Cambodia! Awesome post!